With J hook and chunky yarn, Ch 42. Join to form a ring making sure your chain is not twisted. Ch 3, Dc in next st, *Ch 2, Sk 2, 2 Dc in next st*. *Repeat to end and join with a Sl St to top of Ch-3. (14 2-Dc sets; 14 2-st spaces) Do Not Turn. Oven mitt is worked in the round. Sl St over and into the center hole of the next scale, Ch 3 and Dc in same space. *Ch 2, 2 Dc in space between the next scales making sure you go through both layers front to back, between the 2-Dc sets*. * Repeat to end and join with a Sl St to top of Ch-3. Tip: At end of round 3, you should have a Ch-2 and then Sl St into top of Ch-3. Ch 1, Sk 1st 2-Dc set and work crocodile scale stitch around the next 2-Dc set so scales are staggered over each other from prior round. *Sk next 2-Dc set and work crocodile scale stitch around the next 2-Dc set*. * Repeat to end and join with a Sl St to top of Ch-1. Until you have 10 scale rounds completed. The scale round will be the last round you complete. FO. Close bottom edge of oven mitt with a piece of the blue chunky yarn by doing a whip stitch around the base chain. By doing the whip stitch around the base chain you allow the bottom crocodile stitches to hang freely. With G hook, attach white cotton yarn at upper right edge corner and Sc around the top edge of the oven mitt. Join with Sl St into beg. Ch 1, *work 1 Sc Dec over the next 2 sts, Sc in next 6 sts*, Repeat to end and join with a Sl St to top of Ch-1. Sc in ea st around. Don’t join — just continue working in rounds without joining. Work * 1 Sc Dec over the next 2 sts, then Sc in next 7 sts*. Repeat around. Check the size of the opening. If you have small hands, work this last decrease round. Otherwise just work another round of Sc and make the hanging loop. Additional decrease round for small sized-hands. Sc in ea st around, working 1 Sc Dec 4 times in round as needed for smaller size. At corner, Ch 13. Join into next st and turn. Sc around chain to finish loop. Sl St into beg stitch. FO. 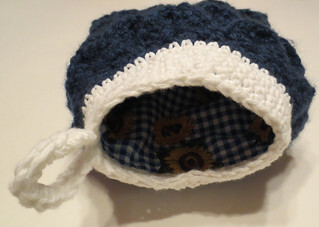 Make lining pocket with right sides together and insert into the crocheted oven mitt. 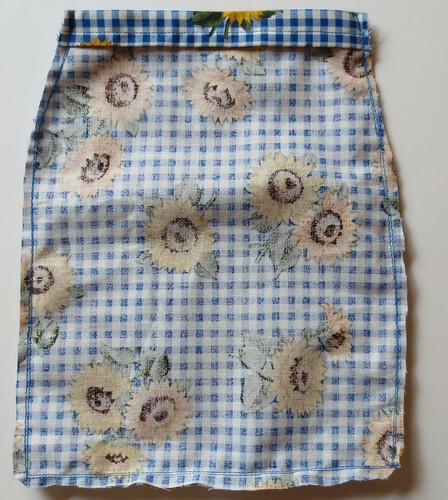 Hand stitch along the inside edge as shown to secure the lining. Personally, I always get a bit twitchy whenever someone suggests using acrylic (or other synthetic fiber) yarn to make something intended for contact with hot surfaces. How would this work with two or three strands of worsted weight cotton held together? Crafty — Yes you could use two strands of cotton held together to crochet this oven mitt. Just check your width on the first rounds to make sure it’s wide enough for your hand. 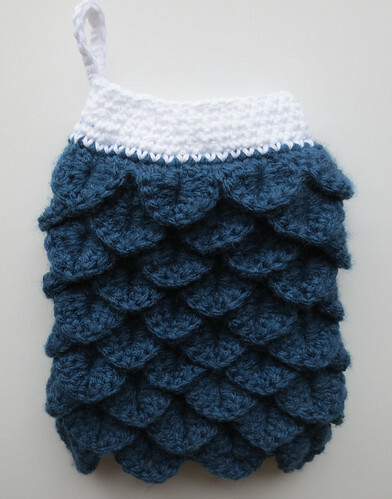 Oh, that Crocodile Stitch ………..I still have to learn it. But this Oven Mitt of yours is very inspiring. Now I am doing Irish Crochet, I learned how to read English patterns. I was looking for directions for the crocodile stitch in the round to use on a pair of booties, yours is the first that I found and will give it a try! I knew there had to be directions out there somewhere, thank you! Paula – Glad you found my crocodile stitch in the round directions. I too had heard about it but didn’t find any actual use of it in a free pattern. I had to play around with the method to get it to work out. Hope this helps you and contact me back should you have any questions as you work the pattern.